Bohemian Waxwings are irregular visitors to the Cedar Creek area. There are records from the winters of 1985-86, 1986-87, and 1987-88. 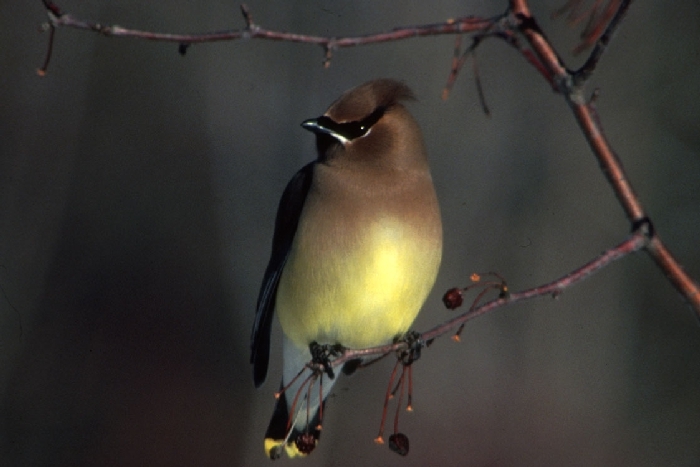 Cedar Waxwings are common breeding birds at Cedar Creek. They commonly nest near the laboratory, in the oak savannahs, Allison Savannah, in residential areas adjacent to the CCNHA, and semicolonially in the coniferous windbreaks along East Bethel Boulevard. Waxwings frequently feed by flycatching at Cedar Creek, especially on the superabundant dragonflies emerging from Fish Lake. Waxwing fledging success at Cedar Creek is apparently poor. Their nests frequently are poorly camouflaged and they nest in areas where crows and jays are abundant. Waxwings are rare in the winter at Cedar Creek, probably because of the scarcity of fruit.